All Spectrum SMA connections are SMA female. A cable with a SMA male connector is needed to attach to the Spectrum product. The BNC male connector is used to directly connect to other instruments. Most table top instruments and also most machines have a BNC female connector and need this cable to be directly connected. 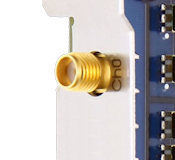 The BNC female connector can be used to connect the Spectrum card to another BNC cable connector or directly to a standard probe. The SMB female connector can be used to interconnect two Spectrum cards for example to distribute clock or trigger signal from one system to another.